Ren’s report for his Science Expo (Grade 2) this First Grading is about the branches of science. With all the many branches, he chooses Robotics. He is so fascinated with robots. He likes drawing, building and playing with robot toys. He even dreams to visit Japan someday because he knows that there are a lot of robots there. With that, I was happy that I discovered the First Robotics Learning Center at Annapolis in Greenhills. We visited them for a trial class a few days ago for Ren to experience what it is to be a robotic engineer even for just a day. Upon seeing the center, I saw that Ren’s face brighten up and he can’t contain his excitement. 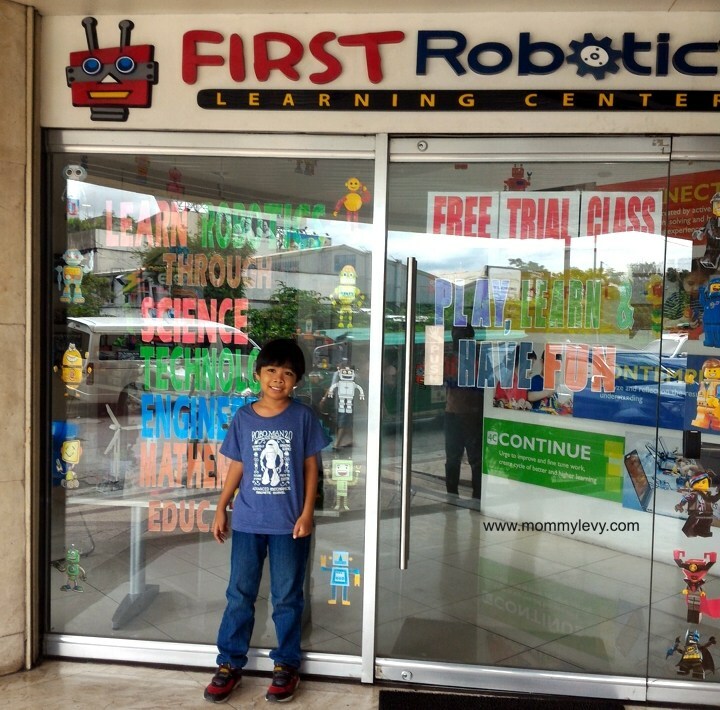 FIRST Robotics Learning Center endeavors to implement the concept of learning with fun. With the center’s fresh and innovative approach to robot designing, kids are assured of assimilating up-to-date information and manipulating state-of-the-art materials which are primarily utilized in the field of robotics. The center emphasizes on STEM (Science, Technology, Engineering and Mathematics) education in its quest to equip the students with competitive robotics literacy. Robotics is a unique opportunity to help kids to become problem solvers and analytical thinkers. Here children explore ways in which people and things move – for example, how animal and human bodies bend and jump, and how machines lift or spin. They learn about simple machines in the home and local community, design and build their own models. Kids will learn hands-on manipulative with integrated technology and curriculum to create a minds-on experience. Kids will have variety of fun and engaging program to introduce our youngest engineers to the concepts of Robotics. This program will utilize their skills to create moving models while enhancing their creative and program-solving abilities. Ren tried the trial class for the 7-8 years old. Before they started, his instructor (Teacher Tina) told him the rules of the class. It’s the same rules like in a regular classroom set-up: listen to the instructions, always ask permission etc. After that, she introduced the different parts that they may need in doing their project and how the class works. Ren was able to create two robots during our visits. He was so happy!!! There are 12 challenges/projects that kids can do per area. They need to finish it to be able to be promoted to a higher level. Students will learn and start designing more advanced models by deepening their understanding of different science concepts such as forces, motion and energy. Students will also start planning and designing their own programs to control the robot functions or behavior. The most challenging & satisfying course that harnesses all the knowledge and experiences learned by the students and how they can put to good use. What I like about this center besides the robotics experience is that the center is clean and they have friendly staff. In here, I think kids will learn how to solve problems, their patience will be challenged and that they will learn to be good in computations. This is a nice after school activity for kids. I wish that they will have a branch here in Alabang soon. I’m sure the Southerners kids will love to try robotics too. Mukhang maganda jan ah, magandang alternative kaysa sa malls! Thanks for sharing. Thank you very much Ma’am Levy for this blog. We hope to see you again in our center.